I didn't enjoy the first couple of months of Punky's life as much as I wanted to. That's not to say that I wasn't happy to have become a Mum, and overjoyed and filled with love for my little munchkin. Because I was. Totally. I could have sat and stared at her all day, her perfect little hands and feet, the little bow mouth and stubby nose. That intoxicating newborn smell. 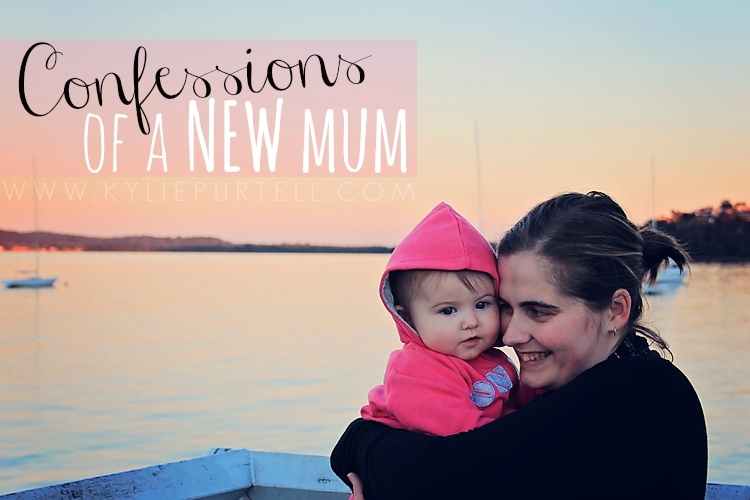 It was just that caring for a brand new baby was so much harder than I ever could have thought it would be. Those first few weeks were just so overwhelming. I was looking everywhere for an instruction manual, to tell me what to do. To reassure me that we were doing the right things. I was just not prepared, by any stretch of the imagination, for having to be completely on-call 24 hours a day, to have someone so helpless relying on me for absolutely everything, relying on me to keep her alive. The shock and pain of breastfeeding, every two hours or less. There's no wonder why they call it 'demand' feeding. The weight of responsibility and anxiety really weighed me down those first 8weeks. I became a little addicted to showers. The shower was the only place where I felt free for just a few minutes, where I felt like myself. Where the pressure to be there for my daughter wasn't the only thing I could see, hear or feel. And when Dave went back to work, and I was left on my own for long stretches with a crying baby, and wasn't able to have a shower? Well, let's just say that the times when I was able to get in that shower I ran that hot water tank dry. But the funny thing is, now, after 8 months, I can sit here and write about how hard I found it, and the fact that I wasn't prepared at all for it, but it kinda feels like it happened to someone else. Like it wasn't really me. I suppose in a lot of ways I am a totally different person now. I've come to terms with the fact that my life is not my own anymore. That I have someone who needs me and relies on my pretty much 24-hours a day, and it's going to be that way for at least the foreseeable future, longer if you factor in other babies. And I'm alright with that. In the beginning it kind of felt like I was just waiting for that moment for someone to come along and say "OK, good job, you've done the work, now it's time to go home and back to your old life" and that wasn't going to happen. My old life was gone. And 8 months later I'm so glad it is, because I feel like in some small way I've actually managed to become this role, a 'Mother', I'm not just some pretender, some little girl playing house. I felt the same exact way! And well breastfeeding no one prepared me well enough for that, but we worked it out in the end. I just think, life will never be the same, and I am ok with that. Holidays are no longer holidays, and weekends are no longer days of relaxing, but now (11 months in) I would't have it any other way! Karen . So true about holidays and weekends! We went on our first holiday in June and as I said to my Mum, we pretty much did the same thing we did at home, just in a different location! Yeah, it does feel good. Challenging as all get out on occasions. I can feel myself stretching, growing, bending and straining but it's all leading in a positive direction. Definitely with you on the positive direction. It's all so worth it at the end of the day. There's no doubt about it - those early months are crazy hard. Wonderful yes, but hard. Yep, I am certainly still loving the shower, I think it will remain that way for at least the next four years! Lol!My fingers crossed that with the next one I'm a little more prepared! One can only hope! I think many mums feel like that. The ones who don't are few and far between (and, I think, LYING!) ;-) Glad things are better now though and you've found the light at the end of the tunnel. It does get easier as they get older. My son is 4 and it's awesome! They're not AS needy/reliant on you. I know how you feel. Lior's first few months were so tough, I really wanted to give him back. I know that sounds terrible. But it wasn't beacause I didn't love him or anything, it was just that it was so much more than I was able to handle (obviously not though, cause I did handle it...), and I felt so constantly overwhelmed. Some nights I would just cry myself to sleep it was so bad. I guess we're all a bit wiser now. We know what we're getting into with the second ones, whenever they might come along! I definitely had days where I felt like asking somewhere if there was a 'return to sender' address I could use! It's amazing how a good cry can make you feel just a little bit better. I did say to Dave that at least with the next one it won't be sch a surprise how demanding it can be. It's true, if doesn't matter how much people warn you, you really just can't comprehend what it's going to be like. I know what you mean about that first period actually not feeling like yourself.. Its like you are watching yourself from above and you are in a dream! I felt the same.. when I look back i dont think its me! So glad you are on the other side of that period and enjoying new motherhood!! I reckon it's a bit of a coping mechanism and a trick of the mind. If you were too connected at the time you would go mad with the pressure and sleep deprivation, and if you continued to feel it properly afterwards no-one would ever have a second child! Lol! Kind like the pain of giving birth I think! That old chestnut is oh so true! I'm really hoping that next time I'll be a little more prepared to just go with the flow and be super worried and second-guessing every last little thing due to previous experience. Thank you! I've been playing around with a few ideas for a couple of weeks on the test blog, I really didn't like the colours of the old one, I think this suits me much more! Lol! I said to Dave that while I don't expect the next one will be any easier, I'll at least have some sort of an idea of what I'm doing this time and hopefully won't be freaking out so much! Hi Kylie. Just letting you know you will be one of Flash Blog Friday's featured writers next week. Cheers Bree. Holy Cow! Thank you so much!